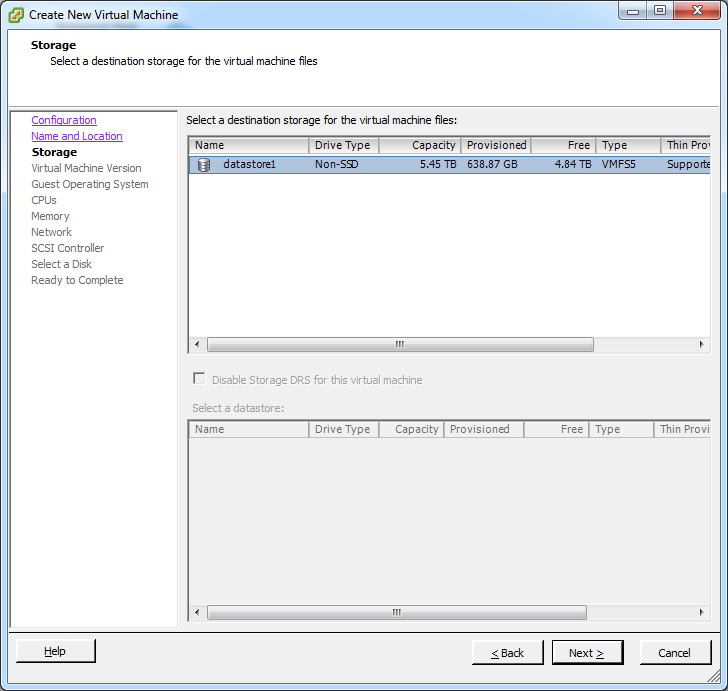 First you need to create a new virtual machine in VMware ESXi. You can do this ether by right clicking on the server itself or on a resource pool. 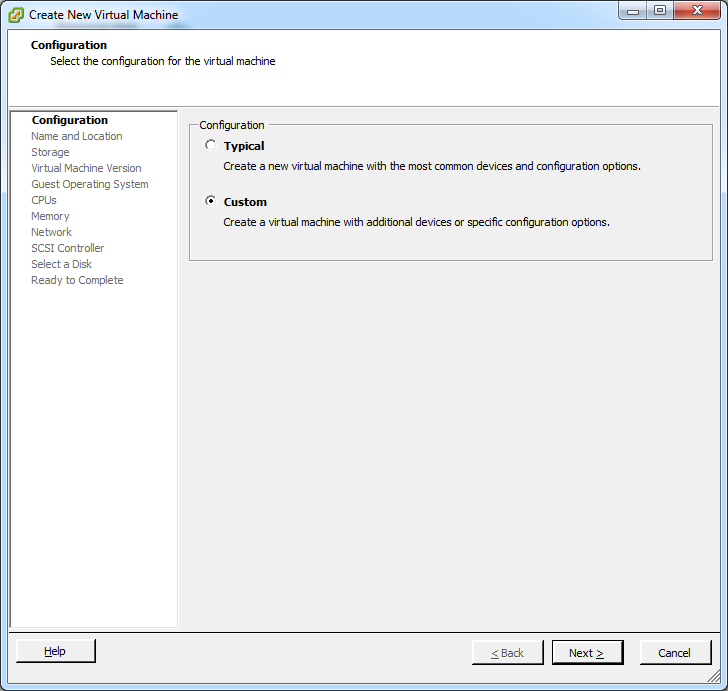 After you clicked on “Create New Virtual Machine” you will be prompted with this dialog. Now check the Custom radio button and press Next. 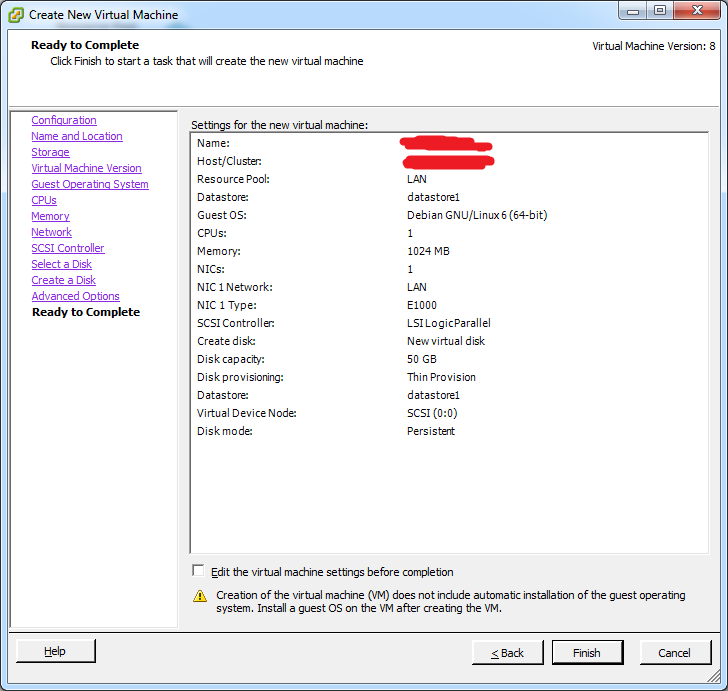 Then you have to give the virtual machine a name. 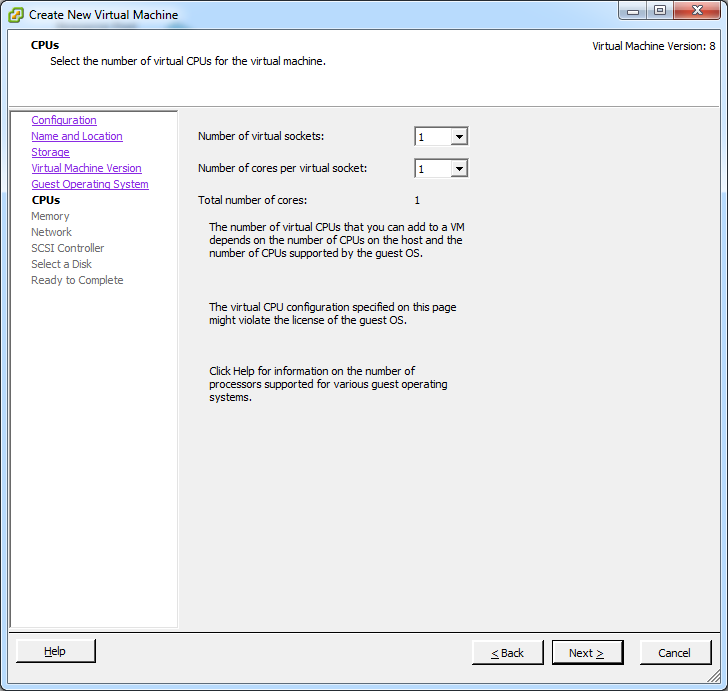 Mine I always start with “vm”, followed by the role of the machine and an numbered index (starting with 1 per role). Click Next. 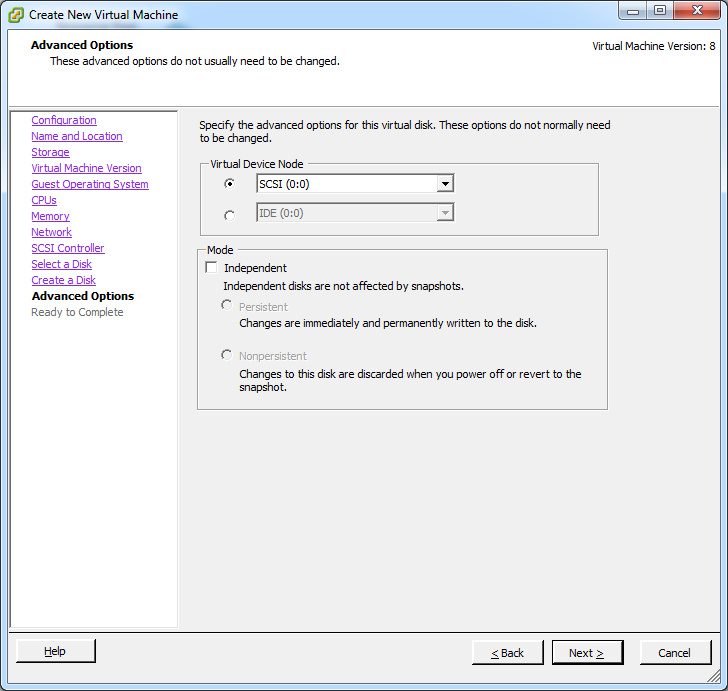 Now you have to choose the datastore on which the virtual machine will be stored. On here I only have one datastore so there is not many choices. This will be looking quite different on your machine, i suppose. So please select the suitable datastore for your setup. Click on Next. Now we have to choose which Operating System we want to install. Here we are choosing Debian 6 (64-bit) for the reason, well, we want to install Debian (as the title says). If you want something else, then please choose it in here. I don’t know what the effects on this option are, but I’d rather set it wright, won’t cost me too much. Click on Next. 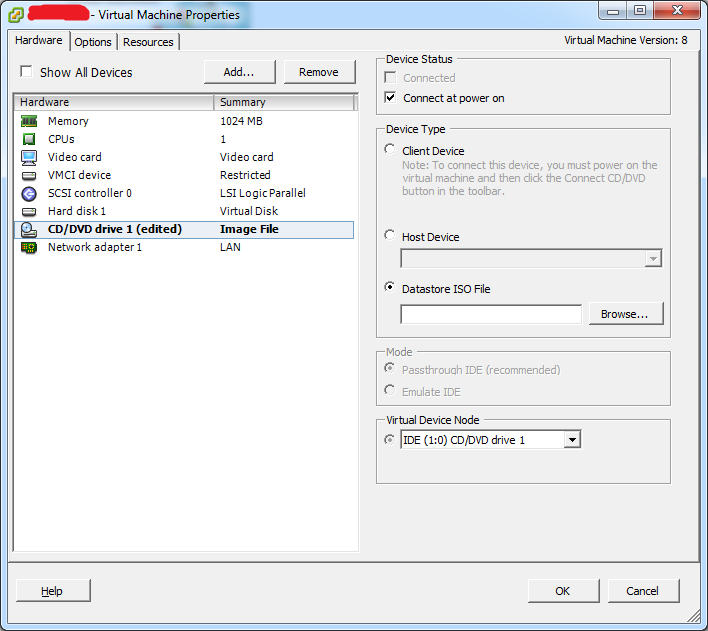 On this screen you can choose on how many CPUs the virtual machine “sees”. You can set on how many sockets (like physical CPUs) and how many cores each socket has. This has nothing to do with the real physical machine your ESXi server is running on. Choose this carefully, it may interfere with the overall performance of your host and your guest system. If you want some power on your guest system, then choose 2-4 CPUs (but only if you really need multiple processing), otherwise only 1 CPU should do the trick. If you’re finished, click on Next. 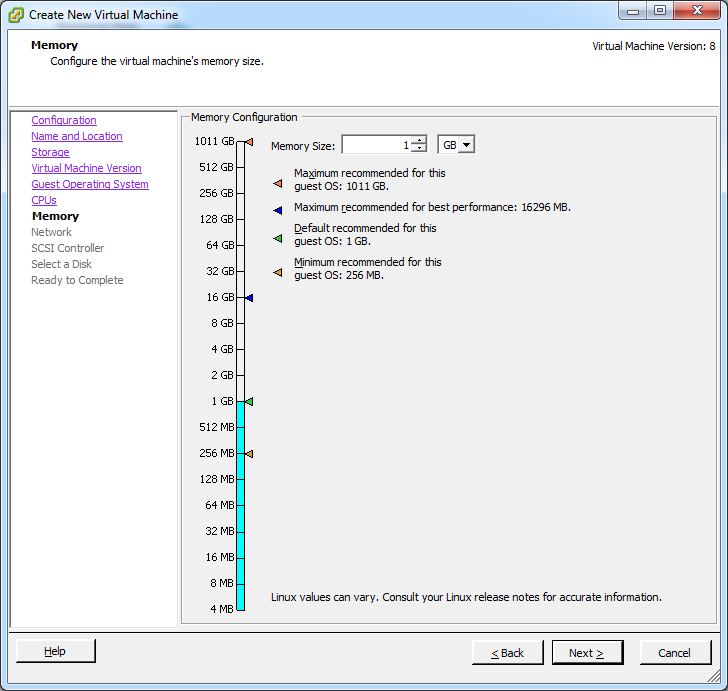 On this screen you can choose on how many Memory the virtual machine will see (at maximum). It says it right on the screen what the minimum, default and maximum recommended is for your OS. It’s pretty the same as on the screen before: Choose what you think your machine is needing. If your running like a backup service or some other “not productive” service, then you can really choose about 256MB, but if your running a game server or whatever that needs much space and power, you have to go for 2-4 GB or even more! After setting the value you’d wished, please press Next. 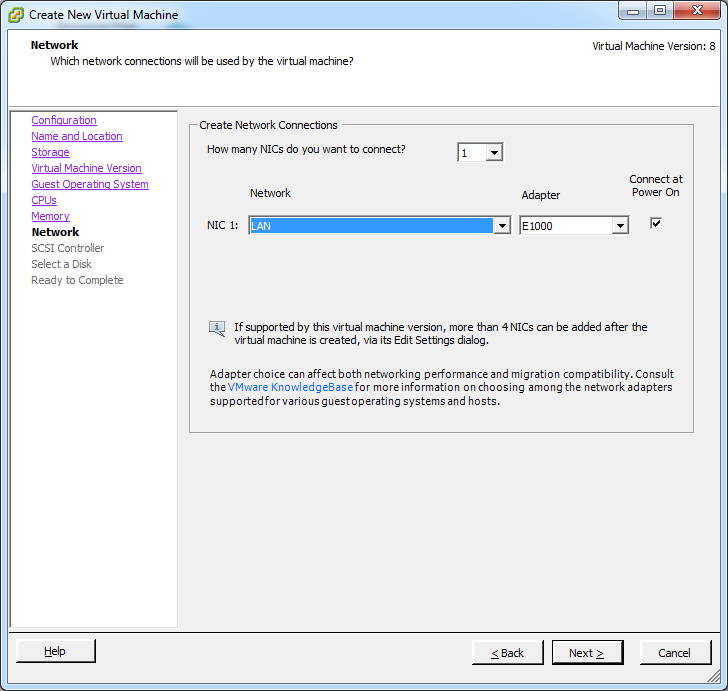 Now you have to choose which network interfaces your virtual machine is gonna get. To know more about my network setup I have used on the ESXi, please read this in a later post (insert link here as soon it is available!). Normally your machine will only get 1 interface. But if you wanna setup a router, than of course, you have to insert more interfaces (at least 2). After you’ve set this for your machine, please click on Next. Here you can choose the controller for your hard disk your machine is gonna get. I always choose here the default one (LSI Logic Parallel), because I really don’t know the difference it gonna make at the end. If someone has a useful reading about this, please tell me in the comments (I really wanna know!). But I don’t have experienced much problems with this setting so far, so I can honestly say it will work. Just click Next, if you’re finished. 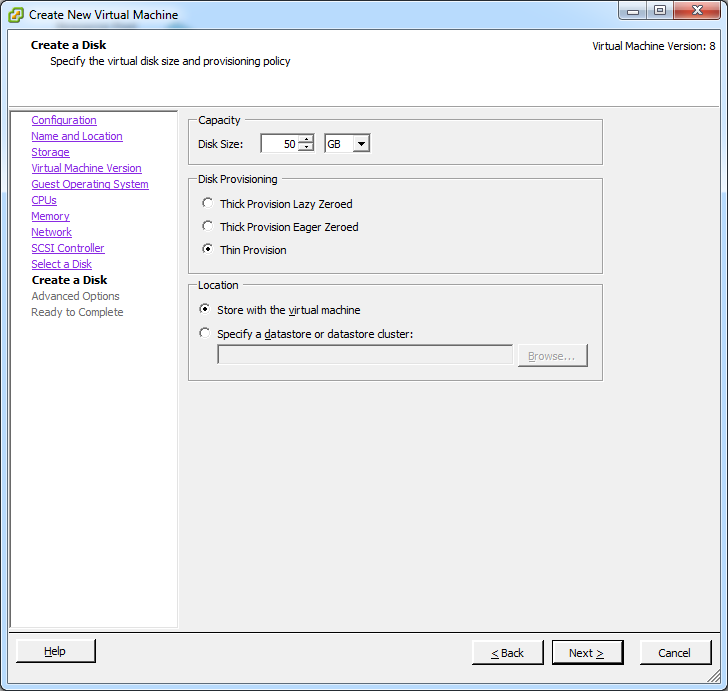 Most likely (except if you already have a virtual disk) you will create a new disk. Click Next. Now you have to choose how large your disk will become. This strongly depends on what service(s) the virtual machine is gonna run. I recommend to use at least about 50GB, this will give you enough space for log files etc. If, of course, you will setup a web server or something with many data, you most likely will use about 500GB or more. The second choice you gonna make is how and where to store the disk: I prefer to use “Thin Provision” simply because it use only the space it needs (that’s why I use at least 50GB for every service). 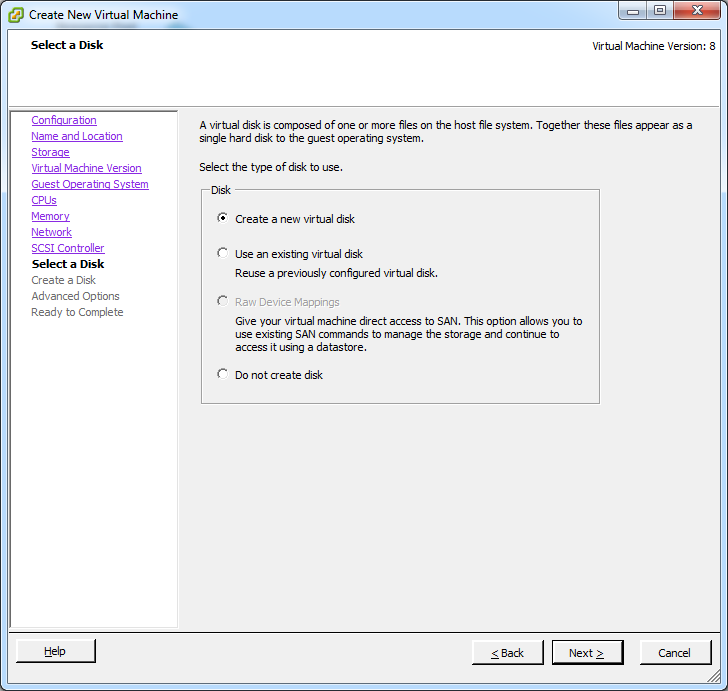 And mostly you will store the disk within the virtual machine. Click Next, when you have set everything. On the Advanced Options screen I usually don’t change anything (I’m happy with the standard settings as seen below). Just click Next. On this screen everything you just set will be shown to you. Just check the settings if you haven’t set anything wrong. If you do you can click on the left side for the corresponding page to change it. Now click Finish. 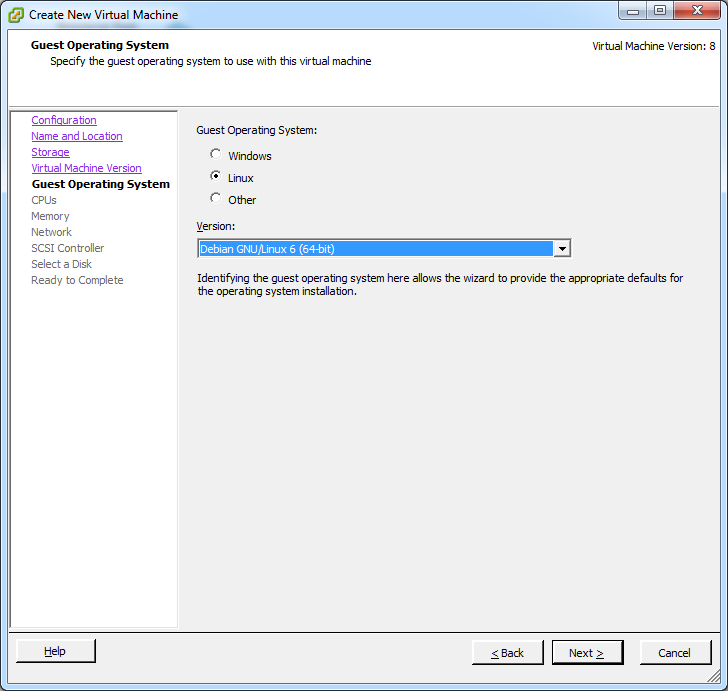 Now you have to Start the virtual machine, to let it generate a MAC address. So just Start it and Shutdown it a few seconds later. 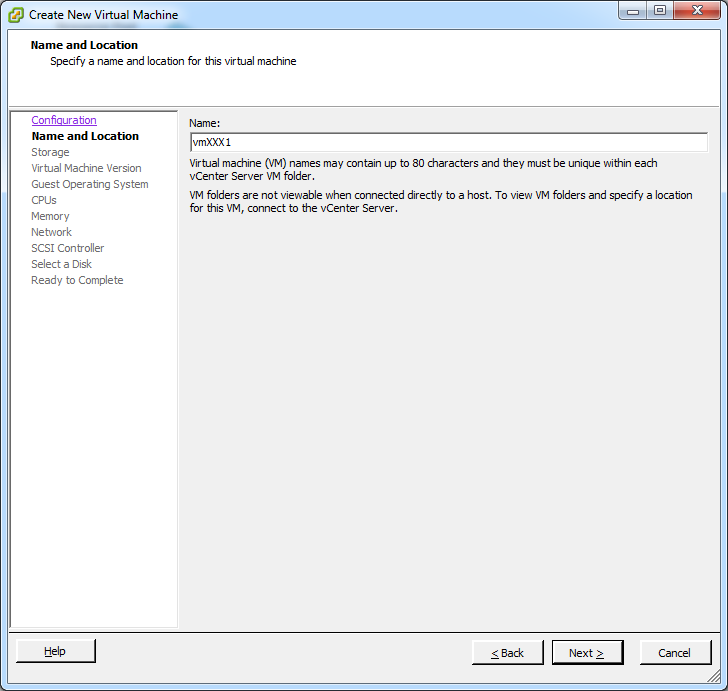 After you did that, you can now edit the virtual machine settings. 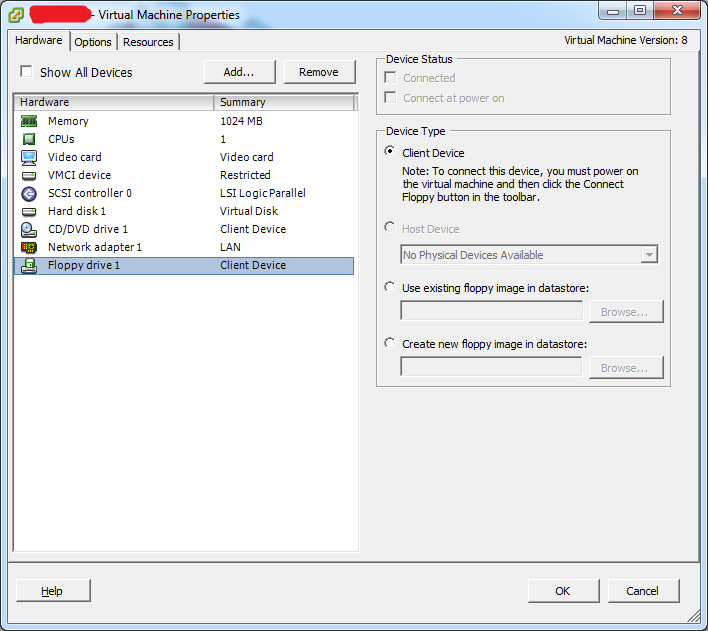 Just right click on the VM and click on Edit Settings…. First you can delete the Floppy disk (really, who needs that anymore?). Just click on it, and click Remove in the right above corner. 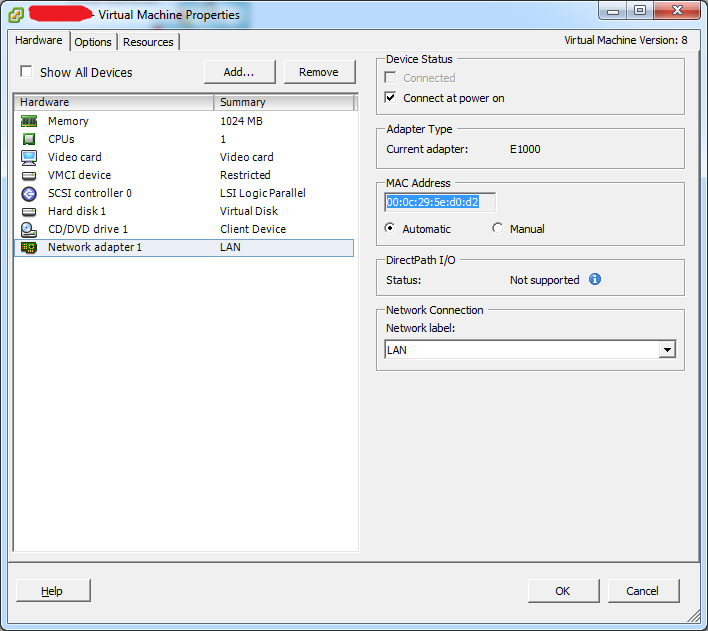 After you have successfully started and stopped the virtual machine, you can go to the Network adapter 1 and copy the MAC Address. Why? Because in my setup I work with fixed leases on my DHCP controlled network. So only machines that my DHCP knows will become an IP address. This MAC Address can now be entered in the DHCP server as a fixed lease. 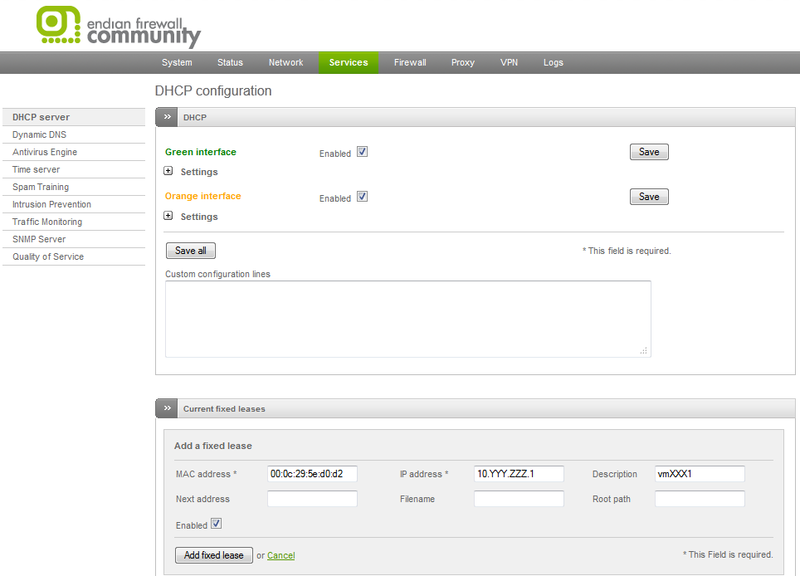 Here I use the Endian Firewall (http://www.endian.com/en/community/overview/) as my router VM. 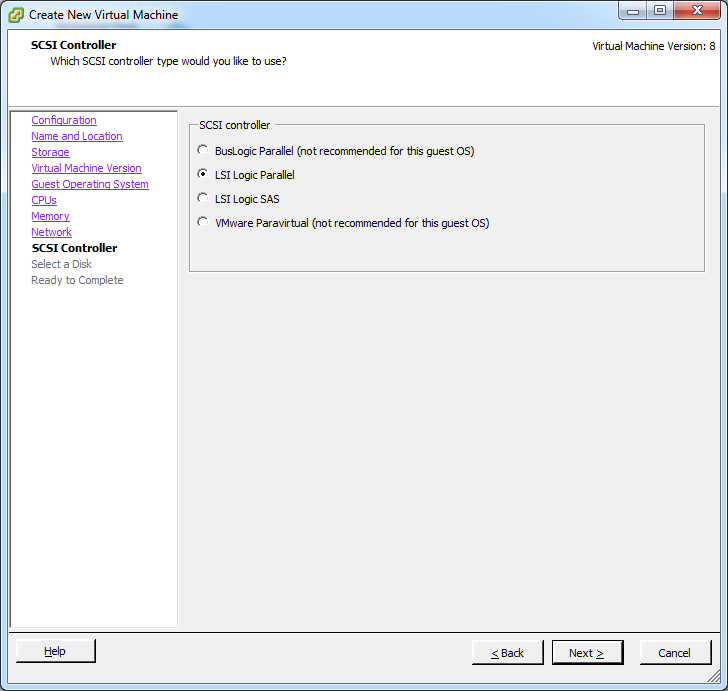 Now with that set, you can insert the install disk into the virtual machine. You can do this with clicking on CD/DVD drive 1 and choose on the Device Status the “Connect at power on” option and under Device Type a file from your datastore (make sure, that you inserted a image in the datastore before you try to choose one here). In my case it is the Debian install image I did get from http://www.debian.org/distrib/netinst. So that’s it. 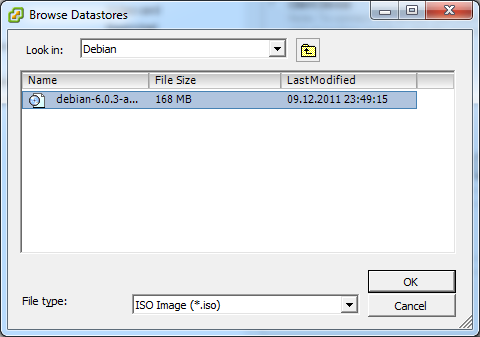 In the next tutorial I will describe how to install Debian on the just created virtual machine. So stay tuned for the next part. Very nice tutorial, just what I was looking for. Thanks Stefan, Also I was wondering if it’s a good idea performance wise to have SAN?